Residents in the rural Queensland town of Oakey have been battling the Department of Defence Force over a water contamination issue that is affecting their crops, livestock, property prices and potentially their heath. Chemicals used in firefighting activities at the nearby Army Aviation Centre have leached into ground water and contaminated the surrounding areas, including the water supply. The residue left by the foam contains compounds known as PFCs, and are particularly difficult to breakdown naturally. Residents have been found to have over 40 times the levels of the national average in their bodies and have been warned not to drink or bathe in the contaminated water. Environmental activist and Shine Lawyers ambassador, Erin Brockovich met with the affected landholders of Oakey at public meeting to discuss their rights and legal opportunities. Erin spoke one-on-one with concerned residents and empowered them to stand strong. Known for her strong stance against environmental contamination, Erin is touring Australia to shine a light on the issue and urge Defence to move proactively in ensuring the residents of Oakey receive the answers and support they need. 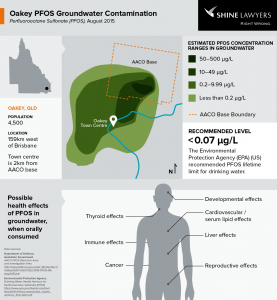 Unfortunately, the contamination in Oakey is not an isolated incident. According to senate reports, many more ADF bases around Australia could have contaminated the local environment. There is also concern that areas surrounding some of our busiest airports may have been impacted. Both the Gold Coast Airport and Brisbane Airport have been identified by Airservices Australia as having PFCs present. Preliminary studies for Brisbane indicated that drinking water had not been affected, while on the Gold Coast health authorities have ordered urgent soil and water testing. Particularly as bore water is used in some of the nearby areas, and the contamination has understandably got local residents worried. Airservices Australia have told newspapers they are currently working with state and national governments to develop regulatory guidance for the management of these compounds. Written by Shine Lawyers on July 31, 2016. Last modified: April 17, 2019.